Media representatives, Native American leaders, cultural historians, gay rights activists and many cowboys rejoiced yesterday afternoon when two long-time partners against crime were united in a civil ceremony on a dude ranch outside Oxnard, California. The marriage was held in strict privacy with only several hundred invited guests in attendance. Reporters hiding in the hills and using high-powered spotter scopes were able to identify only a few attendees. Among them were Johnny Depp, Bob Seger, Bono, Harvey Fierstein and Doris Day. Bob Dylan’s Wedding Song was voiced by Lady Ga Ga. Because of strong dust storms in the area, GaGa was forced to lip-sync the song. The only tape available was a 1982 rendition by Liza Minnelli. “Because of their on again, off again relationship, we had doubts the ceremony would ever really become a reality,” said Chief Running Water of the Potawatomi nation. Tonto is a member of that particular tribe, but as a part-time actor, he has often been confused with playing a Mohawk of Ontario, Canada. Neither Tonto or the Lone Ranger were available for comment. Moments after the vows were exchanged, the two boarded a Tomahawk helicopter and were flown to a spa somewhere near Twenty-nine Palms. Several friends close to the pair agreed to speak to this reporter on condition of anonymity. Asked about the unusual names the happy couple have used with each other over the years, one friend chimed in: “Well, we know that Tonto translates from the Spanish into a less than kind word, so sometimes the Ranger uses Toro, meaning “bull”. I pressed on because that was my job. Apparently, the bond was made then and there and they have rarely been separated since. “What’s with the mask?” I asked, blindly. I thought I had pushed these guys enough, but I kept on. 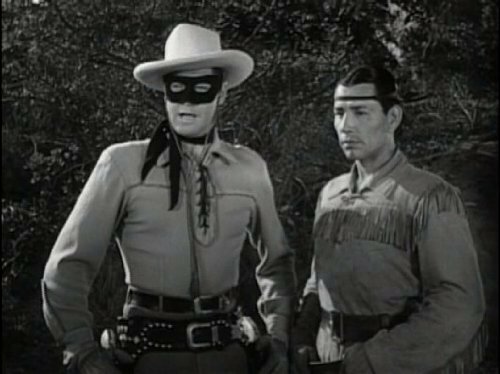 “It was the mask that apparently intrigued Tonto enough to keep hanging around the ranger,” someone from the back said. I back off. I’m no hero. I had enough for the story. So, there you have it, folks. Two strange men, always alone, always doing the right thing to help the helpless, finally seal their fate. Right about now, they’re probably in a whirlpool spa somewhere on the edge of the Mohave Desert. Word has it that they are going to open a landscape decorating business somewhere near Pismo Beach. “Hi Ho to them,” I say.